Centrifugal extract low-noise and low-watt fan for ceiling mounting. Intermittent or continuous ventilation of bathrooms, showers, kitchens and other domestic spaces.For high-resistant ventilation systems.Integrated LED-light with low energy demand (Ceileo Light models). 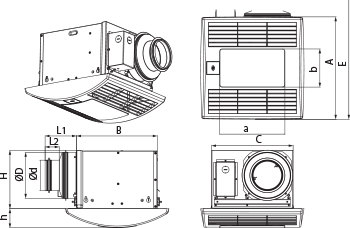 The modular design enables easy retrofitting with the optional humidity and motion sensors (except for the basic model) or the grille with a light.Low noise level.The centrifugal impeller has forward curved blades for high pressure and low noise.The motor impeller is made of high-quality durable ABS plastic.The fans also feature a gravity backdraft damper.Ingress protection rating IPХ4.Compatible with Ø 100 or 150 mm air ducts. The casing is made of galvanized steel.The clip-on plastic grille ensures easy mounting and cleaning of the fan.The modular design enables easy retrofitting with the optional humidity and motion sensors (except for the basic model) or the grille with a light. Ceileo Light fans are both equipped with an energy-efficient LED light. The Ceileo fans are equipped with reliable asynchronous two-speed motors with overheating protection. The maintenance-free permanently lubricated motor bearings are engineered for over 40 000 operating hours of trouble-free operation. Ceileo: Double-speed basic fan model.Ceileo T: Models with an adjustable turn-off delay timer. This model can also be retrofitted with an optional humidity or motion sensor (available on a special order). air flow for the modes 1 and 2. The fan is controlled by means of the CDP-2/10 speed switch (available as a specially ordered accessory). Timer "Т": The fan is constantly set to Mode 1. The mode 2 is triggered by the light switch closing. Upon the light switch opening the built-in turn-off delay timer keeps the fan running in the mode 2 from 1 to 90 minutes. On elapsing of this period the fan reverts to the mode 1. Timer "Т" and humidity sensor (available as a specially ordered accessory): the fan runs constantly in the mode 1. If the indoor humidity level exceeds the sensor threshold value set in the 60-90 % range, the fan switches to the mode 2. 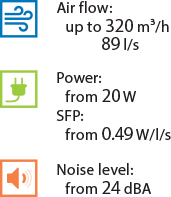 When the humidity level reverts to the pre-set value, the built-in turn-off delay timer keeps the fan running in the mode 2 from 1 to 90 minutes. On elapsing of this period the fan reverts to the mode 1. Timer "Т" and motion sensor (available as a specially ordered accessory): the fan runs constantly in the mode 1. If the motion sensor detects movement within its range, the fan goes to the mode 2. When the movement is no longer registered, the built-in turn-off delay timer keeps the fan running in the mode 2 from 1 to 90 minutes. On elapsing of this period the fan reverts to the mode 1. 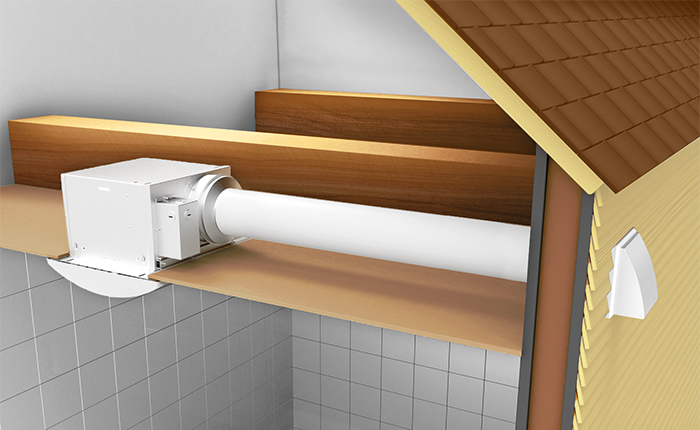 The fan is integrated into ceiling spaces.The fan is attached to the ceiling joists with spreader claws and self-tapping screws. The flexible air duct is attached to the fan exhaust spigot with a fixing clamp.